The server I am running the installation was already used to install XP1 topology, and everything worked just fine. Right after post my question, realized that sqlcmd was not installed at the server - which is weird, because XP1 topology didn't require at all! Once I got both installed, it was just a matter to re-run the XP0. Thank you, Vinicius. To add to the correct answer, after downloading the two utilities from your answer, my problem was not resolved. I encountered into the same issue when running Sitecore installation using SIF on staging environment where SQL server was not added to environment variables. 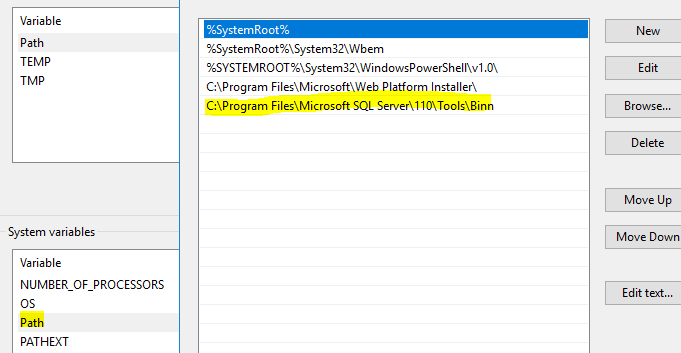 When running the SIF on dev/staging/prod environments where SQL server management studio is not installed, after installing the 2 utilities, we need to make sure that environment System variable Path should contain C:\Program Files\Microsoft SQL Server\110\Tools\Binn which is a location of "SQLCMD.EXE"
Not the answer you're looking for? Browse other questions tagged sql-database installation sitecore-install-framework or ask your own question.